Thought the iPhone 6 camera was good? Well, it's about to get a whole lot better, as a new add-on will turn it into an incredible camera with a 1-inch 20MP sensor.All you need to do to is plug the DxO One add-on into the Lightning port of your device. Oh, and part with £499 as well. That price tag does seem incredibly steep for something you plug into your smartphone, but it looks like it could be well worth the price. For a start, it's created by camera experts DxO. While it's not best known for its hardware, DxO certainly knows what makes for excellent camera quality thanks to its experience of putting cameras through their paces. The tiny unit can be carried around in your pocket, and although it makes the iPhone it's attached to look a little ugly, it's certainly more convenient than lugging around a big DSLR. A free iOS app lets you control the camera, and a built-in microSD card lets you store all your images – so people with the 16GB iPhone 6 can breathe easy. We should be seeing it later on this year, and it wil be packed in with DxO OpticPro and DxO FilmPack software, which get sold seperately for £159 and £99 respectively, which makes the high price tag of the DxO One a bit more palatable. 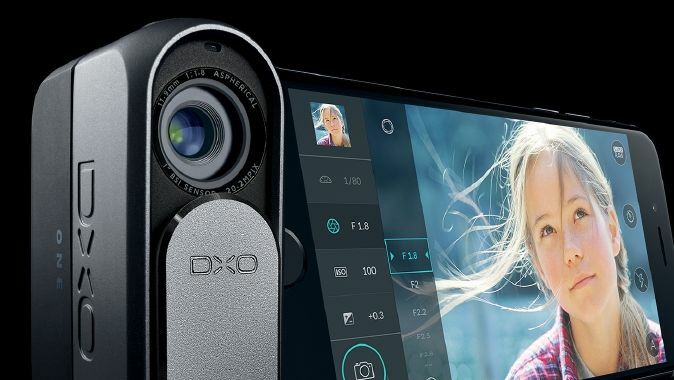 Jerome Meniere, CEO and founder of DxO explained that “being image lovers at DxO, we have built the camera we dreamed of for ourselves and could not find anywhere else: uncompromised image quality always available in our pocket”. After shelling out £499 for the device, your pockets will probably have plenty of space for it.